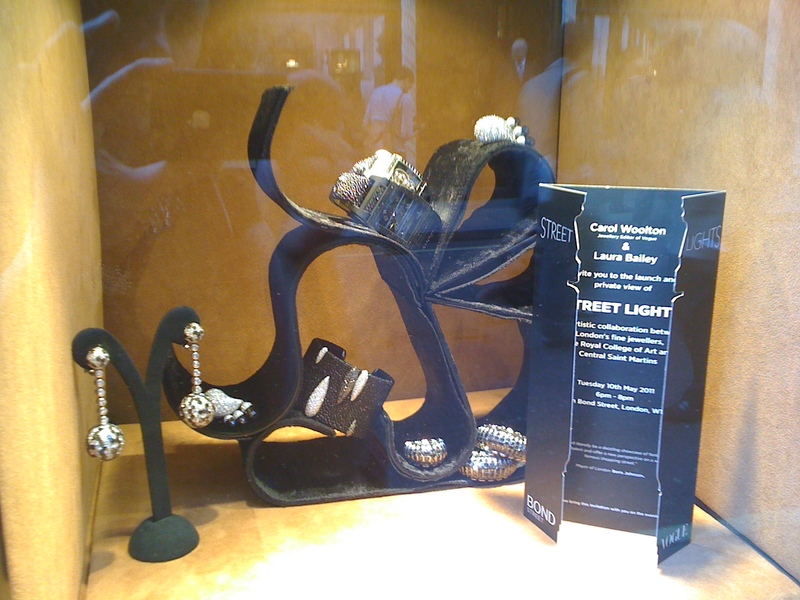 Earlier this month I was excited to go along to the opening of the Bond Street ‘Street Lights’ project, organised by Carol Woolton, jewellery editor of Vogue, in conjunction with students from the Royal College of Art and Central St Martins. 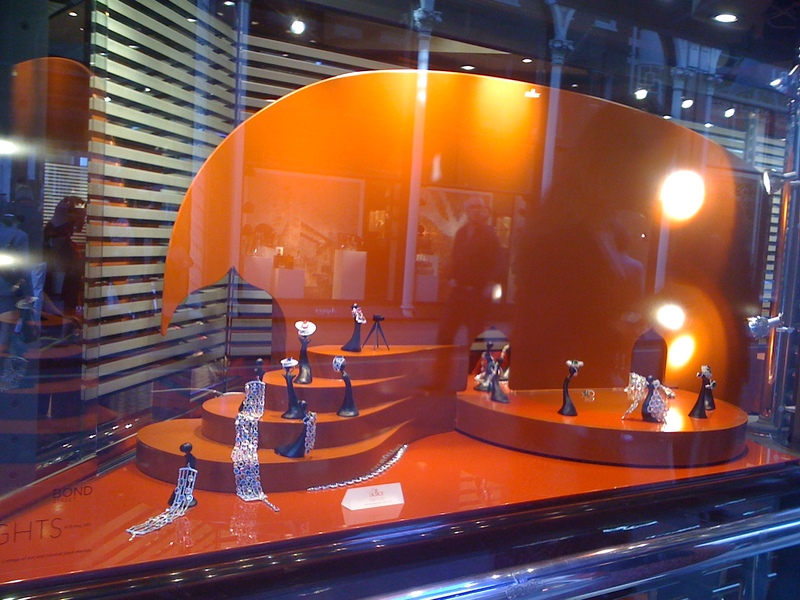 The project was initially started by Carol to try and shake up the world of fine jewellery visual merchandising, and I understood completely why, having wandered down Bond Street researching point of displays the week before the launch to be greeted by rows upon rows of busts and jewellery stands, mostly black. As Carol herself put it, most of the windows look “to put it bluntly: so dull”. Carol gave a wonderful and warm welcome, with Laura in a beautiful delicate pink Chanel number then declaring the evening open. 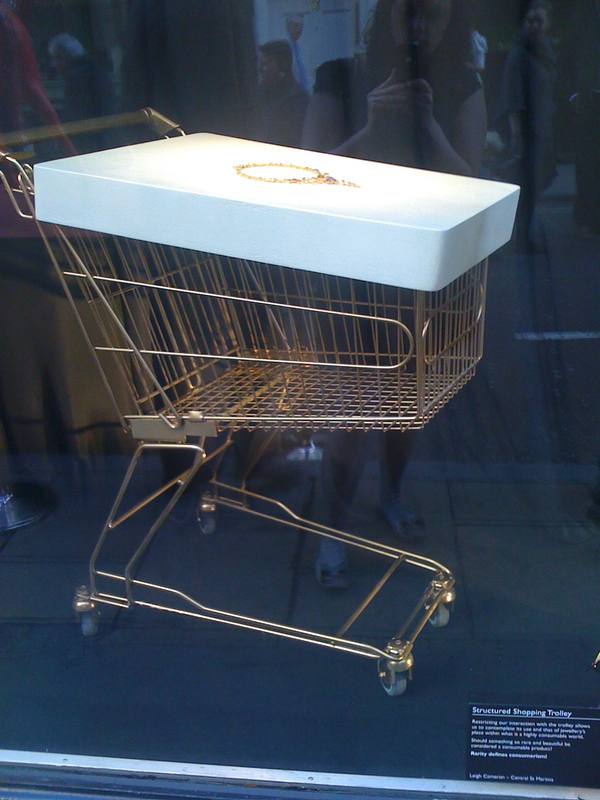 It seemed to me that an injection of creativity from some of the finest young artistic talent from the local art colleges was an inspired idea and the exact thing needed to kick some liveliness into the displays. However, there are definitely two distinct camps in the practise of VM for fine jewellery, the first and traditional approach being to keep the background neutral/subtle in order to let the beauty of the jewels to speak for itself. 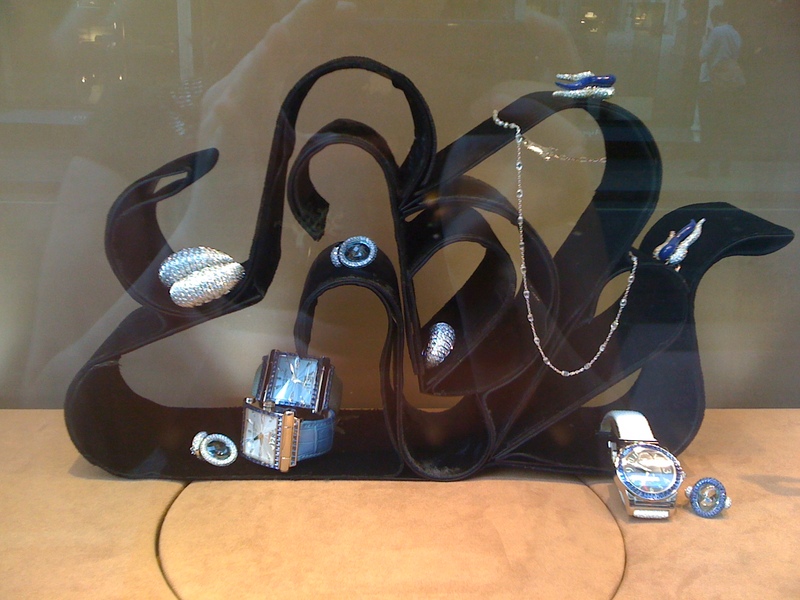 There were plenty of examples of this done spectacularly well, most notably for me Van Cleef & Arpel and De Beers. 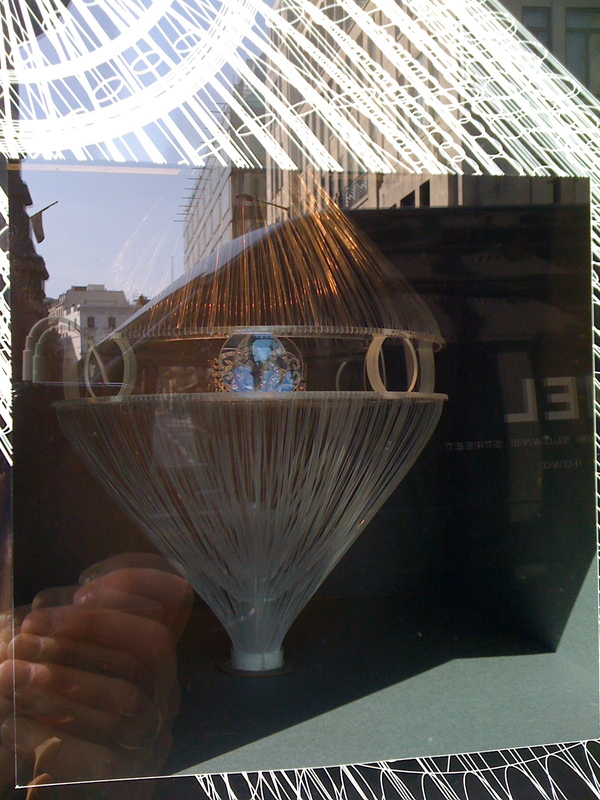 At the other end of the spectrum some artists let their imaginations run totally wild and created wonderful miniature worlds inside a window, eg Georg Jensen & …. Some of the students I spoke to suggested this might have been down to whether or not they were working totally independently or under the watchful eyes of the store’s VM team! I loved the second approach and suspect this was more the point of the whole exercise, after all if a display makes you turn your head and capture your imagination, then hasn’t the creative speaking for the brand been totally successful? I snapped some of the windows that stood out to me. Which window is your favourite? The Van Cleef windows reminded me of the scene in C.S.Lewis where all of the creatures of Narnia are gathered for a feast, including Talking Trees who dine on different types of soil which apparently all taste and look very different e.g loamy smooth/rich & crumbly. Edmund thinks they look so good he decides to taste some only to find soil isn’t very appetizing for humans! 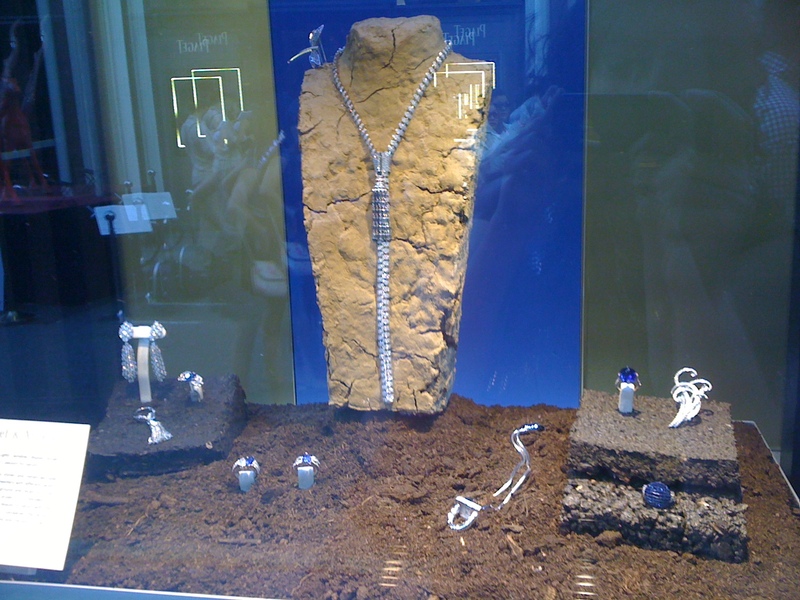 I loved this display, a fantastic reminder of the provenance of diamonds. The Tiffany theme was all centred on optical illusions & kaleidoscopes. Very cool. 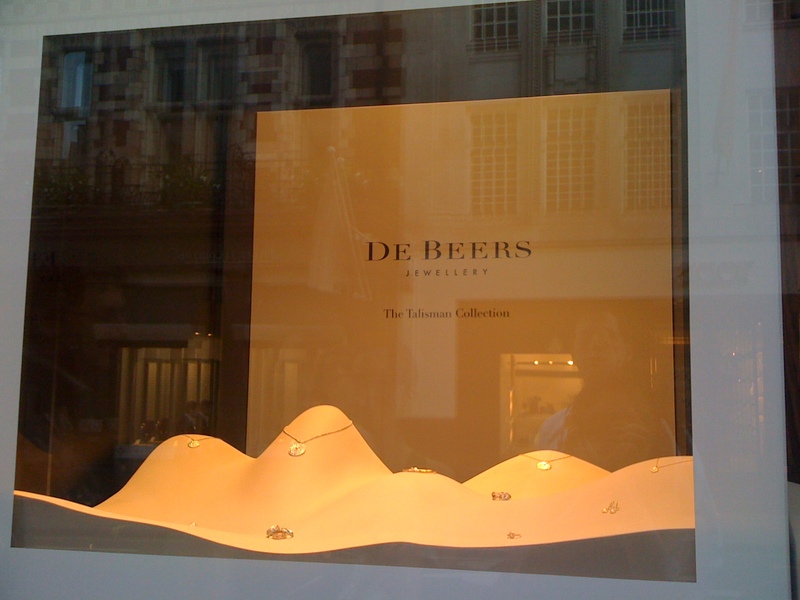 De Beers desert scene – like stumbling into Aladdins Cave in Arabia. Now wheres that lamp…? 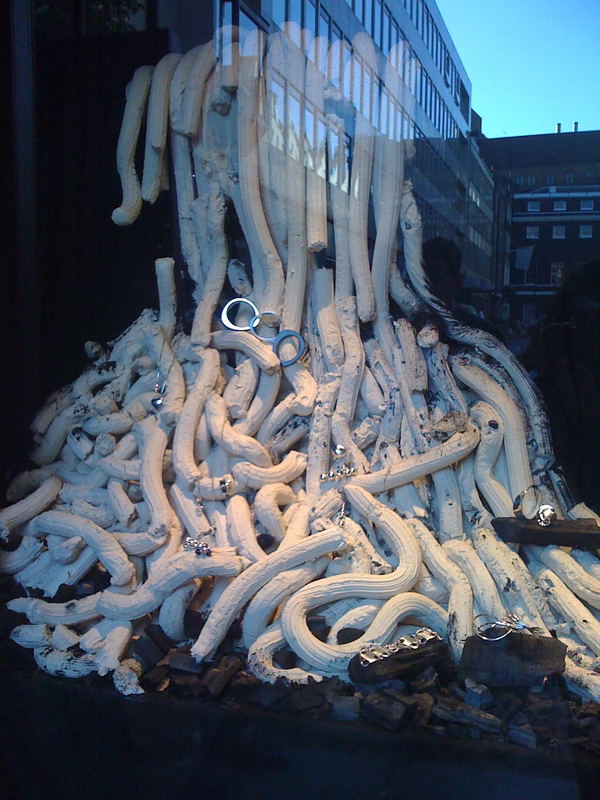 dramatic art installation made from ceramic white tubes (Georg Jensen began his artistic career as a ceramicist) tumbling into a pit of dark charcoal. 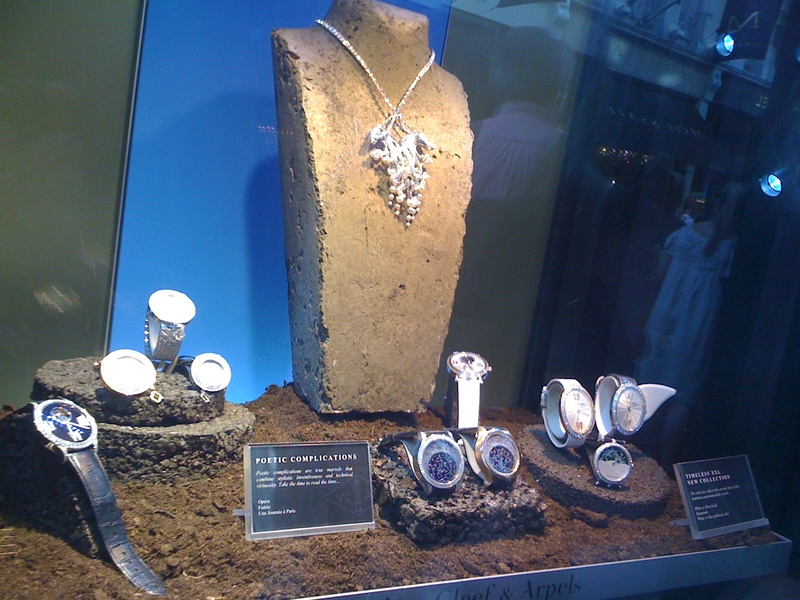 The materials used really brought our their unique textures and colours, and although some thought this display too busy I thought it provided a great contrast to the high shine of the jewels, plus you had to spend a few minutes feasting your eyes! I liked the interesting shapes created by this novel stand, like an intricate ribbon. This circular centrepeice was inspired by a fashion show and rotated so that the jewels appeared and disappeared behind a screen. I wasnt sure about the orange/red used myself but nevertheless a striking display. 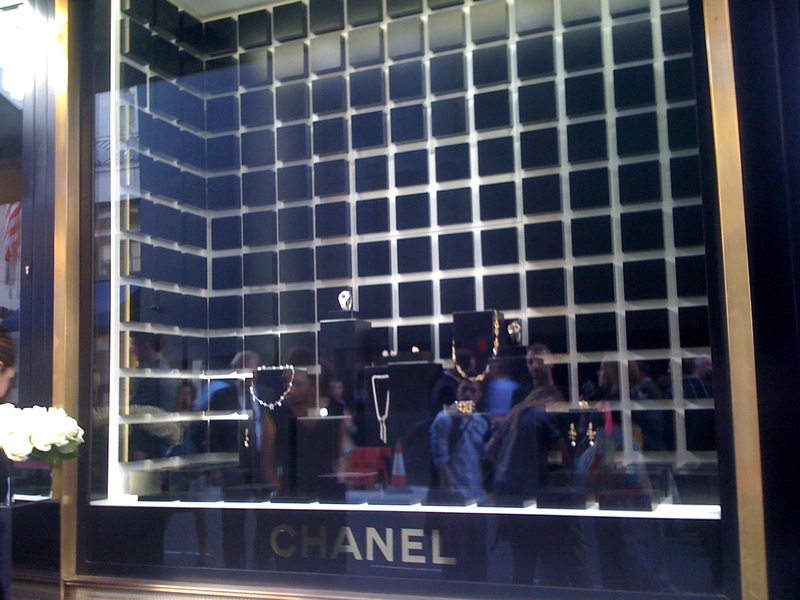 I think the Chanel window was particularly successful at capturing & projecting the brand. The whole display reminded me of a highly stylised city & high rise buildings. Bet Mr Lagerfeld would have given his seal of approval! 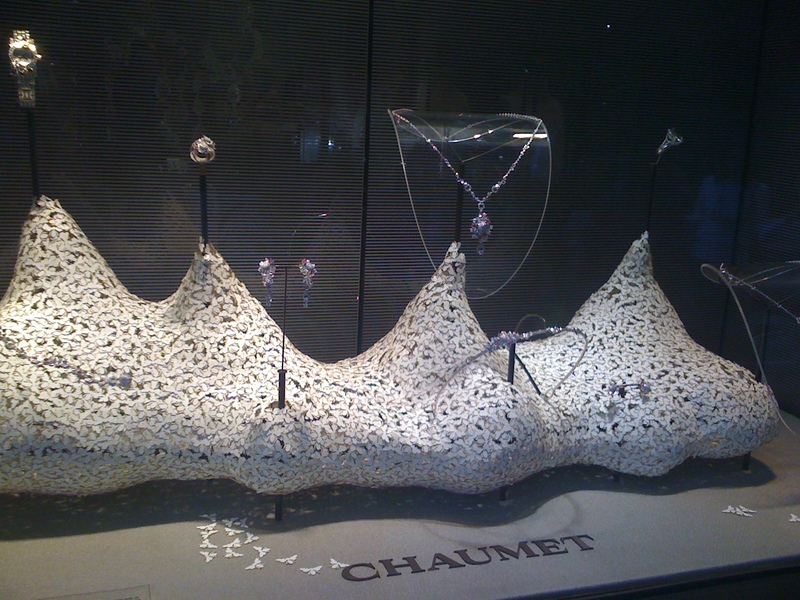 A swarm of over 5,000 hand assembled paper bees at Chaumet, astonishing amount of work & effort went into this creation. 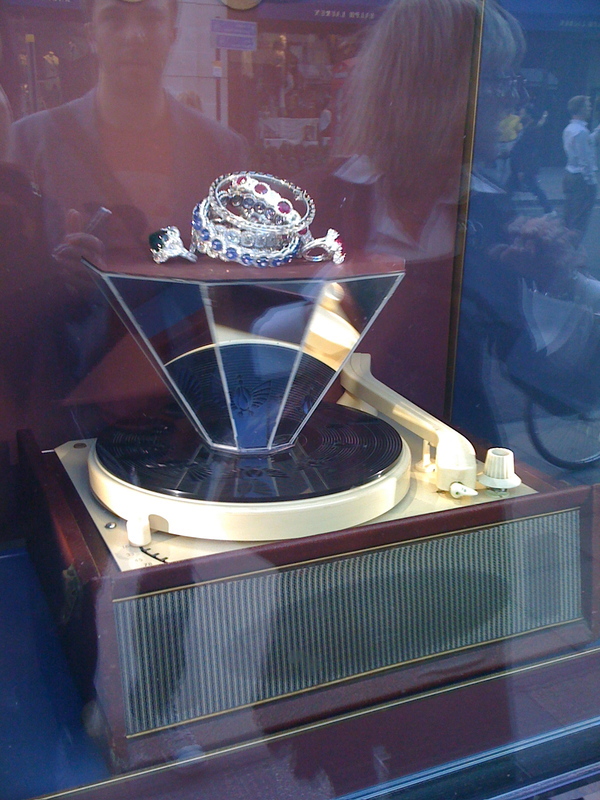 This diamond shaped stand on a record player spun around as the artists put it ‘flirtatiously’, flashing its sparkle to the world in a silent dance. Leigh’s work raised some very interesting points about fine jewellery & consumerism. This display made me smile. 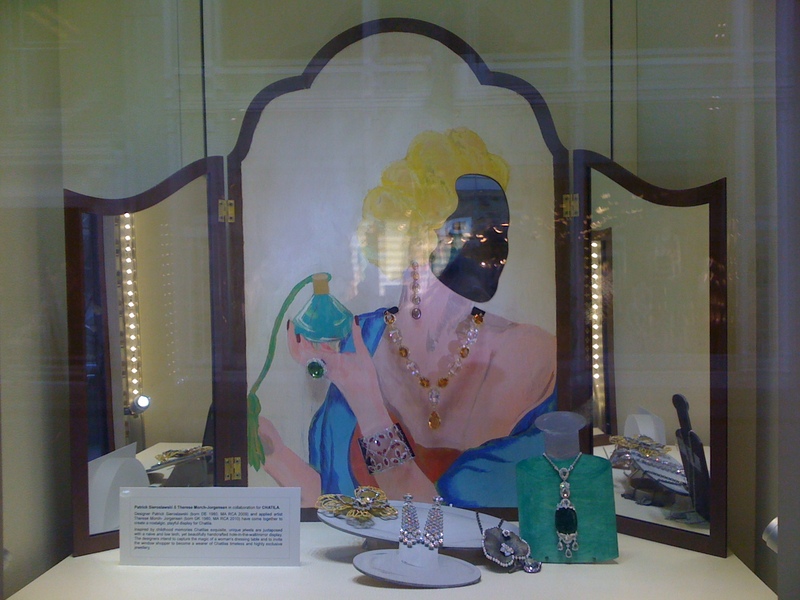 Well what lady doesn’t pass Bond Street and picture filling her dressing table full of precious things?